Halloween is less than 45 days away. Painters wait all year for the season to roll around to fill their calendars and take advantage of great bookings. According to the National Retail Federation (NRF), Americans spent 7.4 BILLION dollars on Halloween decor, candy and costumes in 2014. Surely our services are included in that figure, considering our face art gives that over the top touch every Halloween addict is looking for. So before you go out and spend zillions on new supplies, I made a list of 5 essentials to have in your kit this Halloween season to help you maximize your profits and cater to the Halloween requests. Halloween doesn’t have to be all a bout blood and gore, but you also can’t hide from the bloody zombie requests. 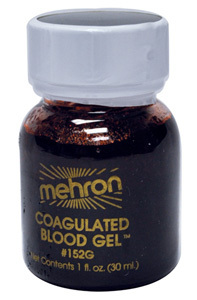 So one of the most essential components of your kit should be regular old stage blood. 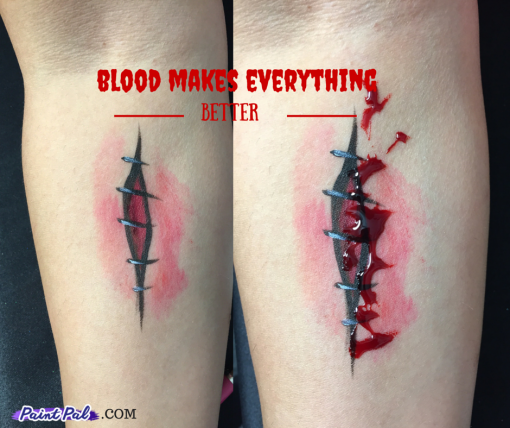 Stage blood can transform any design into a Halloween delight. You’d be surprised how by adding a little stage blood you can drastically change the effect. Stage blood ranges from $3-$15 depending on the size bottle. At a $3 investment it’s worth the ohhhsss and aweees it will create after you add blood to a zombie. Make sure to check out our FXCosplay Channel for tips and info about the different types of blood and to help you decide which is the best for your kit. 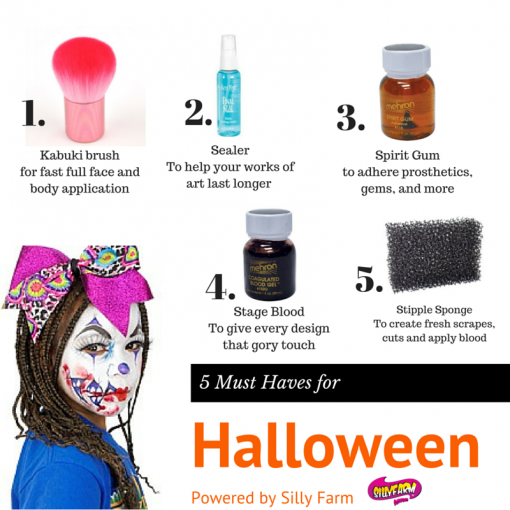 My second suggestion for a Halloween kit must have is a Kabuki brush. Most Halloween faces are more intricate and involved than our day to day butterflies and Spiderman faces. So it helps to have a great tool to help you cover and base the face and body with an even coverage. 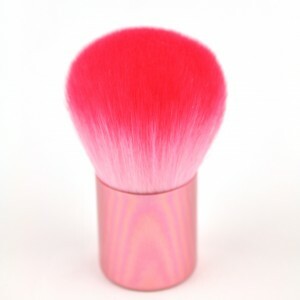 A Kabuki brush has been used for make up application for years, and once face painters learned that it is awesome for covering large areas fast, it became a must have. A kabuki brush is ideal to use to base the skin because it has a handle, to avoid your hands turning into trucker hands right away (aka dirty paint hands), and because the soft hairs spread the paint evenly. When I am asked to body paint for Halloween, or any other time and I plan on airbrushing the design I like to base the model first with a coat of color and then airbrush on top. Sometimes a body brush can leave streaks, but a Kabuki brush smoothes on the paint almost as if you are buffing the paint on the skin. The only down side to using a kabuki with face paint is that we tend to over saturate the kabuki and soak all the hairs. The Kabuki is very thick so once its submersed in water it can stay wet for a long time. So try to avoid soaking your kabuki, simply mist the paint and then rub on the surface clean by spraying the kabuki and rubbing on a dry paper towel. Another product that you can make use of all year is fixer spray. There are several different types of fixer sprays ranging from aerosol to spray. Fixer sprays can be applied before or after you create a masterpiece and helps extend the longevity of the art. I prefer spraying the skin before I begin painting so that the sealer acts as a barrier between the paint and skin and seals the pores to help reduce sweating. Setting spray can also be used after you complete the art work by misting the skin lightly. Kryolan makes a great aerosol fixer that is light weight and can extend the life through sweat and long days. I like the aerosol because it is less wet when applied on the skin and very light. Final Seal by Ben Nye comes in a spray bottle (non aerosol) and has a minty fragrance. Some painters like the scent, and others prefer an odorless setting spray. Regardless of the setting spray you choose to use, its worth having in your kit. When you spend long hours creating a masterpiece the last thing you want is for it to sweat right off or smear. Setting spray is also a great up sell to your clients. They will usually pay a higher price for art they believe will last longer. Fixers start at $6 and a 2 oz bottle can last up to 50 applications, making it a great deal and a worth while investment for your kit. A stipple sponge is a porous sponge that is made of a plastic like material versus a foam or latex. It has large pores and is excellent for creating scraped effects, beards, or to create spotted patterns. Stipple sponges range from $1.50-$3.00 and because of the material they are made of can last forever. I highly recommend keeping one in your kit for year long scruffy beards and fresh scraped wounds. ProsAide and spirit gum are also beneficial to have in your kit year round. Pros Aide (Prosthetic adhesive) is a medical grade adhesive that is latex free and can be used to adhere prosthetics, gems, glitter and anything else you want to comfortably attach to the skin. Pros Aide has a slightly stronger hold than spirit gum, so it is recommended when you have sensitive skin clients or want to adhere something to a younger model. For a super long, strong hold we recommend Telesis. It is one of the strongest skin safe adhesives and excellent to use when you are applying prosthetics for a haunted house or when your models will be sweating or moving a lot. 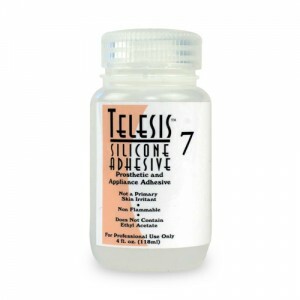 But make sure you have Telesis remover, to avoid irritation or extra time spent removing from the skin. Pros Aid and spirit gum don’t require specials removers, they can easily be removed with alcohol or baby or mineral oil).